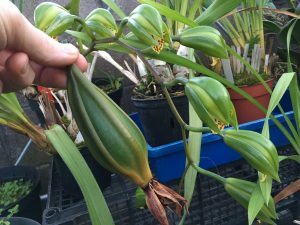 Today we sowed Cymbidium hookerianum seeds using the green pod method. The seed pod has been maturing since we pollinated flowers in January 2017 and we are sowing seed just as this year’s flowers open on parent plants (see photo above). 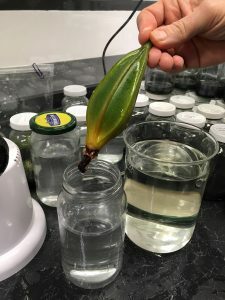 One of the seed pods has split (the seed has been dried and stored) while the other pod has been sown by Jess, Joe and Tallis in our propagation lab. 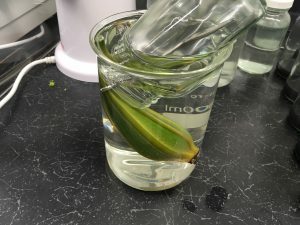 We started by trimming dried flower parts of the seed pod and then soaking it in 50% supermarket bleach for twenty minutes to sterilze the outside of the pod. The picture shows that we needed an 1000ml beaker instead of our usual jam jar to soak the pod. After twenty minutes in bleach we rinsed the pod in sterile water. Jess then cut the end off the pod with a sterile scalpel. All the work was done in a laminar flow cabinet to give clean air and hands were washed and the cleaned with hand sanitiser. 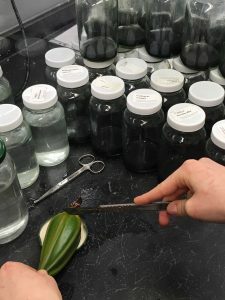 Seed was then shaken into prepared sterile jars of growing media and the lids sealed. Our aim is to sow around 500 seeds into each jar and we completed 100 jars so that is half a million seeds. The rest of the seed was shaken onto paper and will be dried for storage in the seed bank. We will keep you posted on the progress of the seed and our hopes of taking seedlings to our partner schools in Sikkim. 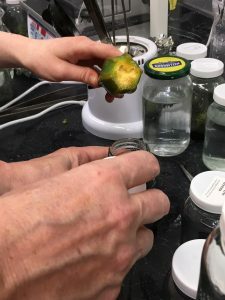 It is fortunate that we have a large and dedicated lab team as seed sowings like this mark the start of many thousands of hours in the propagation lab to raise seedlings to the stage that they can be taken out of their sterile jars and grown on.